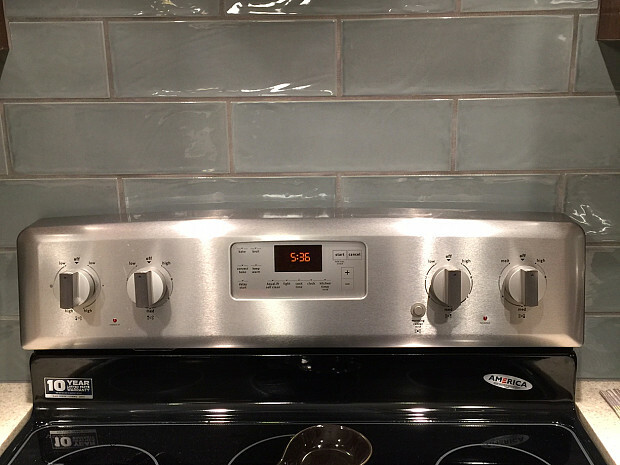 WHAT MY NETWORX CONTRACTOR DID FOR ME: Backsplash tiling. WHY I CHOSE HIM: Professionalism, consideration of my home and my schedule. I recently bought an old house and started a full kitchen remodel. Before it was finished, though, we had to fire the contractor because his work was so bad. 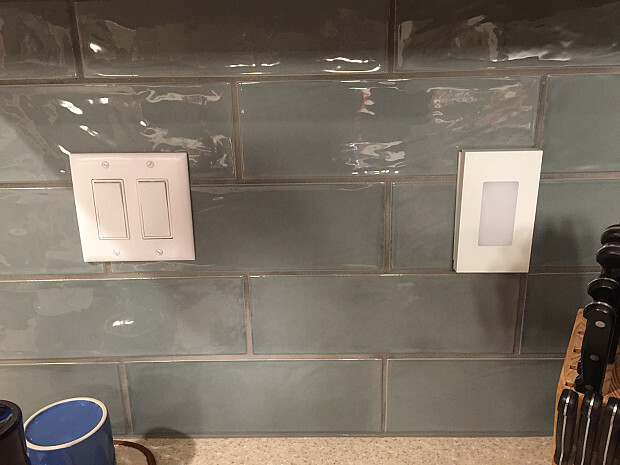 That meant we had to go and find someone else to do the backsplash. When I typed a question into Google: “Who does backsplash tiling in the Dayton Beavercreek area?” Networx came up, offering me several options, including The Grout Medic. I just called the one contractor and when Larry came over to give me an estimate, I was pretty confident that he’d be able to do what I needed done. He was very nice and super professional. Another thing: as soon as he walked into my house, he put those little shoe covers on. When you see someone doing that, it shows they’re conscientious about being in someone else’s house and not wanting to get footprints everywhere. I also liked was Larry’s willingness to work around my schedule. He asked me, “What would be the best time for you?” Sometimes I can work from home, so I said, “If we can do it in these 2 days, that would be great.” And he agreed. As soon as I decided to hire them, I told Larry, who let his office know. Ten minutes later the office was calling me up to make the appointment; they were really on the ball. I had already bought the tile and Boyd, the guy who actually did the tiling, was excellent – very picky, clean, conscientious, and a perfectionist. It took him 2 days – one day to glue all the tiles up and another to grout and caulk it. Larry had told me they would have to leave it overnight to dry on the wall before grouting. Boyd worked hard, till late the first day and all day the next – your 8-to-4 type thing. Every time he made a mess, when wee bits would drop off or whatever, he cleaned it up. I have new countertops, so he covered them the floor, as well, where he was working. Once he was done, he rolled them all up and took them away with him. You wouldn’t have even known he was here. While he was working, I asked him a couple of questions on how to put the tiles up and the best way to do our pencil trim. He was able to answer all my questions and give me some tips. Originally, I was not going to put any tile on the side wall but he said, “You know, it would look better if you had even one line of them, to finish it off. 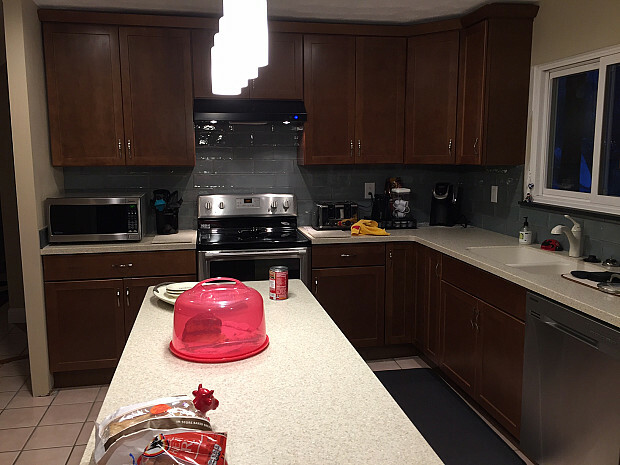 “ I told him to go ahead and when I actually saw it, the area looked so much better with the tile. He’s done a lot of these kitchens and bathrooms, so he knows what looks good. I am very happy with how it turned out. The backsplash looks just beautiful. If someone asked me for a reference, I would say The Grout Medic is the company to go for; I’d also recommend asking for Boyd. Probably their tilers are all good, but I know for sure what a great job he does. I’m going to be doing my bathroom soon and I would like Boyd to do the tiling for it, because he’s that good. My advice is to look up contractors on the internet, before you hire them, and see if they have any reviews or a listing with the Better Business Bureau. A Tile Grouting Job Well Done!! Newly Tiled Floor for a Rental Property by Dave M.
Roof Replacement plus a Whole List of Handyman Jobs by Joseph M.
New Asphalt Roof for my House and Shed after a Storm Blew off 21 (!) Shingles by Jim H.